Episode 3 – The Devil’s Watch? A little over a week ago, I decided to lock my watchbox and forsake my usual vintage mechanical, and high-end quartz serious tickers for just one watch. 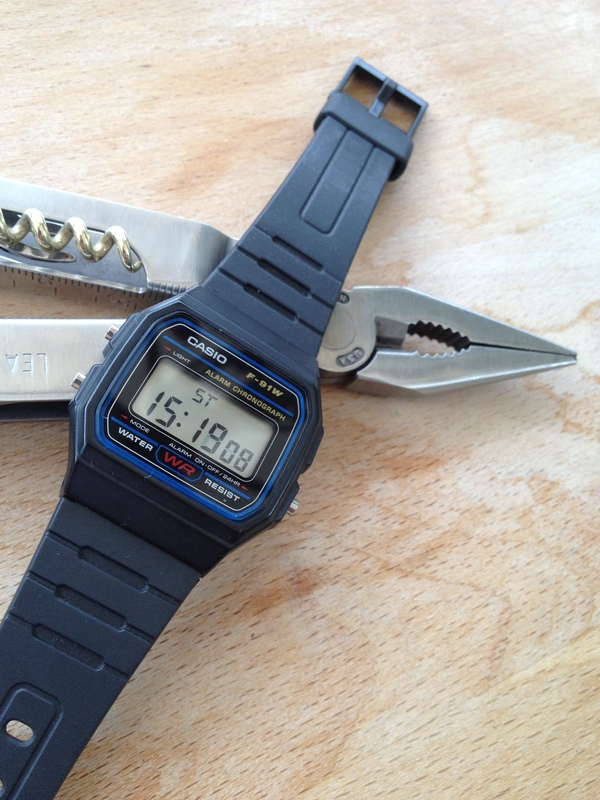 And not any old watch at that – I chose, from Amazon, a £7, resin-cased Casio F-91W, the cheapest of the cheap. A watch for less than the price of two pints of London Pride, a couple of Starbucks coffees (although I’d argue S’bucks has little to do with coffee) or a 3 minute parking ticket in central Oxford. The plan? To wear this single watch for a month. No changes, no backsliding into Breitlingdom or Rolex City, not even for an evening. It’s been fascinating watching watchie people’s reactions to my ‘one watch for a month’ experiment. It’s been almost as fascinating watching the complete non-reaction of normal (i.e. non watchie) people. Watchland reaction has ranged from the horrified to the puzzled. You see, to most watchies, quartz is what powers Satan’s nastiest wristwatch. But even he wouldn’t allow a digital quartz into the seventh circle. Digitals are no watchie’s friend. Apart from a very select few of us who either obstinately believe function matters as much as form or are just plain contrarian. Normal people simply don’t care. Let’s face it, apart from muggers, no-one is really fussed what you’re wearing on your wrist. Unless, perhaps, it’s so truly hideous that people can’t help spot it. Or it’s a Rolex day-date or Sub. If you wear one of the more obvious Rolexes (Rolexi? ), you will spend some time answering the “is it real?” question from observers, never very satisfactorily and always with a slight blush of embarrassment. No, the F-91W is a stealth watch. Not so much Sub as subfusc, it quietly and efficiently gets on with telling you the time (the date, the day and a few other useful things like when you need to wake up) without fuss. That’s what most people want a watch for. But, as utility-based as it is, I think I chose the wrong watch for my (admittedly lighthearted) experiment. I’ve discovered, the F-91W, despite its unashamed utility background (or maybe because of it), achieves rather more than just timekeeping status. It seems to have that indefinable thing that marks a watch out as remarkable. It may even be (pace fellow watchnerds) a bit of a classic. I’d wanted a sort of antiwatch. A watch that ticked all the opposite boxes from the usual contents of my watchbox. But the Casio isn’t it. An antiwatch, under my definition, would have been a watch that pretended to be something it isn’t. A plastic gold Armani thing would have been a better trial. Or maybe even a fake. 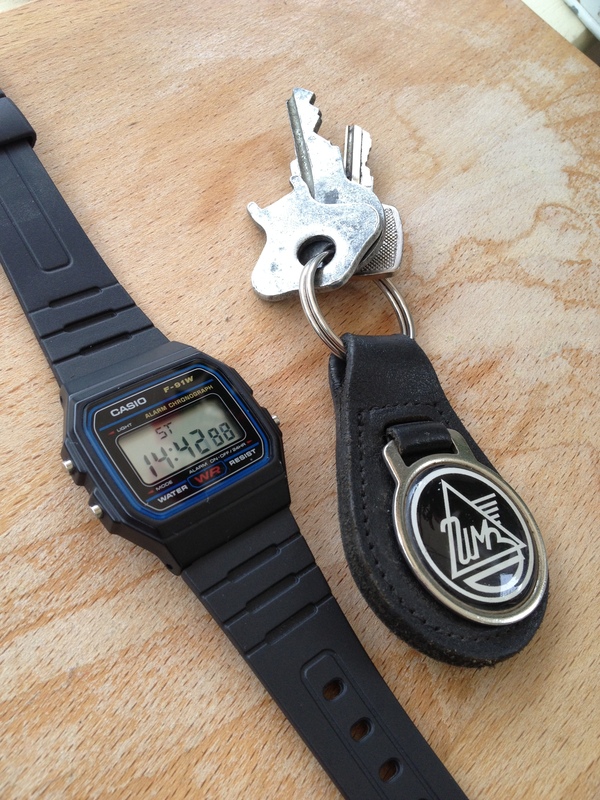 But the Casio makes just as much of a statement as an IWC Ingenieur. It is what it is. Plain, no messing, no pretence. It’s not – as I suggested – a sort of horological Toyota Pious. No, the Pious is a car for people who have principles, but not enough of them to get a bicycle instead. The F-91 is a watch for people who want something that tells the time as simply, cheaply and clearly as possible. It makes a statement by completely not giving a tuppeny toss about making a statement. Given all that, I shouldn’t really have been surprised by people’s affection for the watch. I’ve had a few emails from ex and serving soldiers. They remember their F-91s from their time in camo (or more likely No5 dress) and they remember them fondly. As one said, “Robust doesn’t do the F-91 justice.” Another one talked of how his F (see, the affection of an abbreviated nickname already) had done everything he’d asked of it through two tours in Afghanistan, all without failing once or even needing a new battery. It’s currently doing something rather more domestic – timing one of Pip’s world-class culinary creations in the oven. And I shall be sad when my month with the F is up. It’s not only earned a place in the watchbox, but my affections too. I’ve actually grown fond of the damn thing’s sheer unassailable, unbustable, unapologetic functionality. It’s the watch equivalent of a mongrel terrier. It ain’t pretty, but by God it makes you smile and just plain works. I think a better analogy is to the corkscrew in the picture. You never even think about it until you need it, and when you do it does the job well and without fuss, providing an essential service. I got my all purpose watch from Oxfam ten years ago, still going. It’s a cheap Lorus with a moon and start insert. Apart from that I find sun dials have been quite good this summer.